Dusty maidens have a highly branched stem up to two feet tall with a compact cluster of one to five inch long leaves at the base. The branches are tipped with white or tan flowers that look like pompoms. 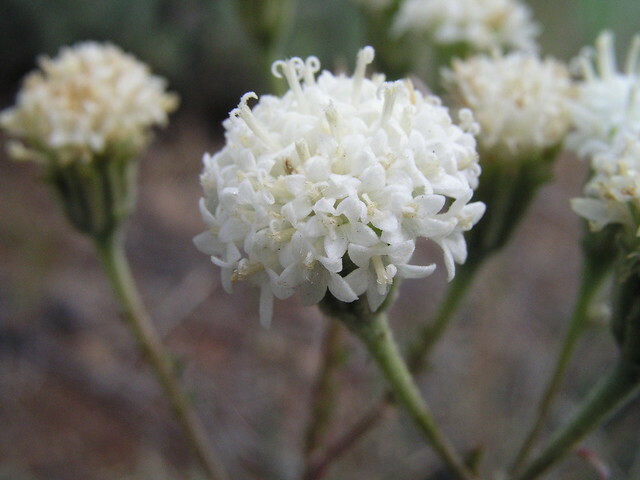 These flower heads are made up of tubular white flowers in a dense round cluster. Dusty maidens may be easily confused with yarrow. The smaller white flower heads of yarrow are more umbrella-like. Yarrow has a distinctive fragrance which dusty maidens lack. Both plants have fern-like leaves but dusty maidens leaves are wider than yarrow. Native Americans called dusty maidens “rattlesnake-tail”, thinking its leaves resembled the rattlesnake’s rattle. Native Americans used to drink a decoction of the plant as a stomach tonic, to relieve swellings, and for general lassitude. It was also used as a wash for chapped hands, skin eruptions, and insect or snake bites.